How Far is Damden Sienna? Damden Sienna was one of the earlier projects of Damden, that delivered luxury-personified, value-driven homes for the IT belt of Whitefield and Brookefield. Conveniently located en route ITPL, Sienna is just a few minutes away from most of the IT companies, international schools, shopping complexes, multiplex cinemas and hospitals. Sienna, as its name suggests, refers to the warm earthy tones and hues that often should embody a home - a perfect place to re-establish one's bond with Mother Earth. With a host of amenities that will unwind you from a rigorous work day, Sienna recharges you with life, thanks to its lush backdrop of Nature. Unique architectural concept blending the ancient science of Vast and modern living. RCC frame structure with solid concrete blocks / brick masonry paneled walls. Living / dining - vitrified tiles , Other rooms - ceramic tiles. Lobby and stairs granite. Ceramic tiles with polished black granite platform. Over the platform - glazed tile dadoing up to 2-ft. height. Stainless steel sink with single bowl with a chromium-plated tap. Ceramic tiles on the floor and glazed tiles on the walls. Good quality ceramic ware for toilets and wash basins with chromium plated fittings. Exterior: Waterproof cement paint. Interior: Oil bound distemper in pleasing shades. Main doorframe of fine teakwood with highly polished veneer sections. All other doors are of salwood sections. Anodised Aluminium 4mm / 5mm clear float glass. Outlets in living area and one bedroom. 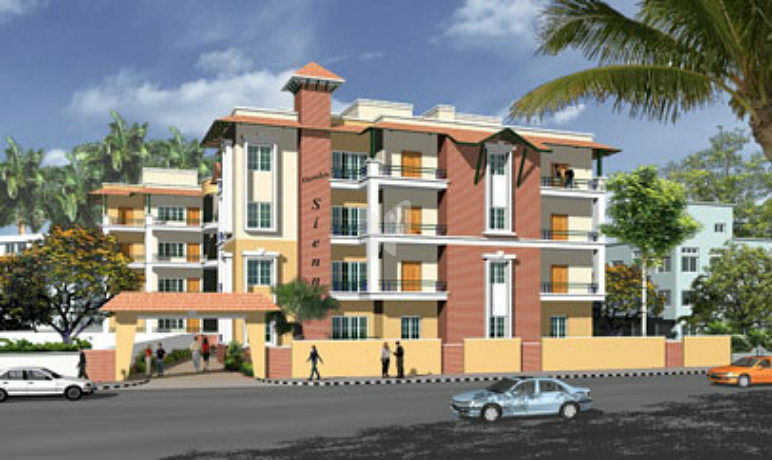 Damden was established with a vision to change the real estate landscape in the country in the year 1996. The Company has diverse interests in Residential and Commercial Real Estate, Hospitality solutions and Plantations. Today Damden has completed more than 2.5 million square feet development, has over 2000 satisfied customers, and projects worth Rs. 790 crores across Bangalore, Mysore, Coimbatore, Mangalore and Kerala. Damden brings in a collective experience of over 80 man years in property development. Our team is made up of young, passionate and highly qualified professionals, each of whom takes personal ownership of every aspect of the real estate business as a whole, and each individual project .Every Damden project is based on an idea that caters to specific customers need. At Damden we focus on innovations in technology and streamlining spaces to reduce costs, and create living spaces that are smarter. Right from choosing the right properties across promising markets to planning and execution, Damden is committed to deliver living and working spaces that are quite away from the ordinary. With its penchant for quality, it is no surprise that Damden has received a quality certification from the Dutch Council for accreditation (ISO 9001).